Within the next couple of weeks I’ll be starting my 7th Round of Beachbody exercise programs. And it will soon be my second year since beginning this journey with my first P90X Fit Test. For this Round, I decided to put together a P90X / X2 Hybrid schedule. Why? Well, I wanted to return to the classic P90X routines for the sake of variety. But I also wanted to enjoy the flexibility and additional recovery time allowed for in P90X-2. I also want to continue to develop my overall physical stability and core strength. I imagine that this schedule will be somewhat harder than straight P90X-2. However, the additional recovery day will hopefully work well with my tennis schedule. If all goes well, then it should also be less demanding than the three P90X/Insanity Hybrids I did, which culminated in a knee injury. Hopefully, the P90X-2 component will help me to avoid future knee issues. In the interest of full disclosure, I borrowed heavily from this P90X/X2 Hybrid schedule developed by P90X-2 cast member Sean Callahan. My schedule differs in that I don’t own or employ the P90X-2 Advanced DVDs and I include 2 rest/recovery days/week. I also ensure, purely for convenience, that Ab Ripper X is used with P90X routines and X2 Ab Ripper is used with P90X-2 routines. I know that I will be in no mood to swap out DVDs at the end of a resistance routine to enjoy the opportunity to take part in 16 minutes of ab ripping from the other program. So without further ado, here’s my anticipated schedule. It’s never written in stone, though. As always, I reserve the right to modify as I see fit to best accommodate my goals. 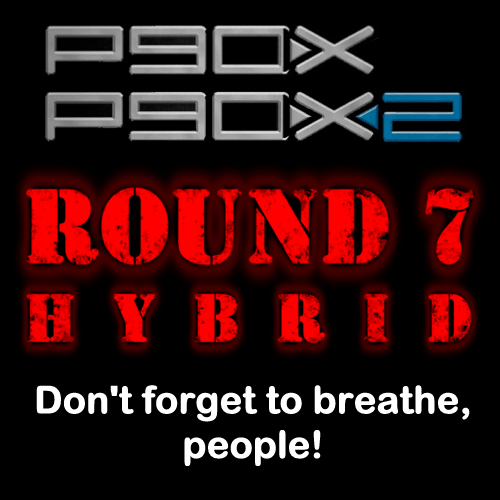 This entry was posted in P90X/X2 Hybrid, Round 7 and tagged Hybrid, P90X, P90X2, Schedule. Bookmark the permalink. Thank you for sharing the p90x/x2 hybrid. Just what I was looking for.